This opening chapter briefly describes the historical, political and social context within which children’s participation in the child protection system takes place. In some childhood institutions adopting the participatory agenda, at least superficially, has been seen as relatively uncontroversial but allowing children the freedom to participate within the context of statutory child protection interventions is complicated because participation potentially places children at risk. However, participation is also a means through which children can realise their rights to protection, not least because it allows them opportunities to increase capacity by developing decision making skills, confidence, articulation, social competence, social responsibility and resilience. 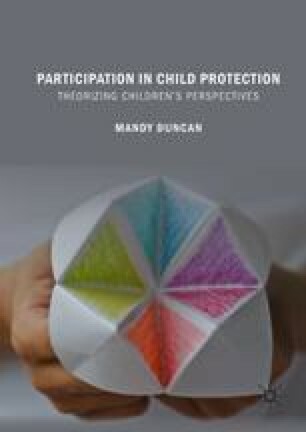 This chapter includes a brief overview of the research project upon which the ensuing theory of children’s participation in child protection interventions was developed, and a brief overview of the analytical framework employed. The chapter also includes an explanation of the way that the book is structured and a synopsis of each of the chapters that follow. Part one of the book presents children’s accounts of their experiences of statutory child protection interventions and part two develops a theory for why children participate in the ways that they do. Council of Europe. (2012). Recommendation CM/Rec(2012)2 of the Committee of Ministers to Member States on the Participation of Children and Young People Under the Age of 18. Available at: https://search.coe.int/cm/Pages/result_details.aspx?ObjectID=09000016805cb0ca. Accessed March 27, 2016. Legislation.gov.uk. (2014). Children and Families Act. Available at: http://www.legislation.gov.uk/ukpga/2014/6/contents/enacted. Accessed April 18, 2018.